One of the many keys to progression and extraordinary performance is SERVICE. In order to allow specific neurochemicals to flow toward feeling great and overall wellbeing, we must shift our states. Serotonin, dopamine, norepinephrine, endorphins, anandamide and oxytocin all play specific roles. Activating and accessing these neurochemicals can take you, your team, family, or company from where you are now to where you want to be. A little love, in the way of service, can shift your state and go a long way. Long-time local Jackson Hole resident Wren Fialka (pictured left) spreads the love. She found her purpose in founding a national grassroots movement turned nonprofit based out of Jackson, Wyoming. 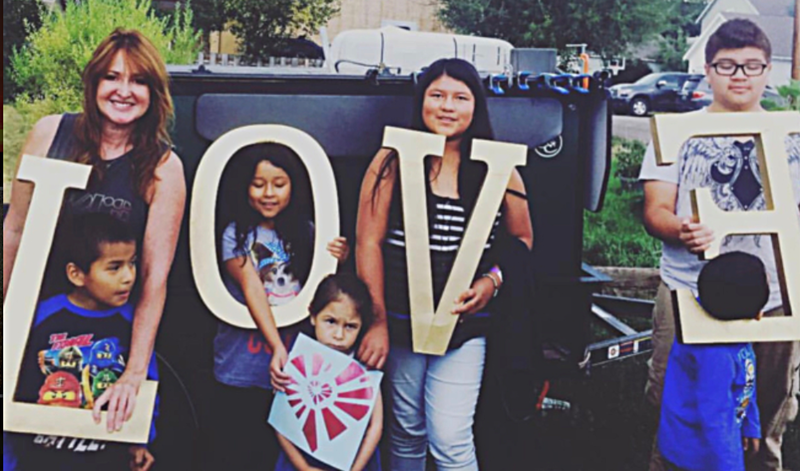 Spread the Love offers personal outreach to those facing homelessness and displacement. These conditions look different in different locations, so their response is always customized to meet the specific population being assisted. Locally, Spread the Love focuses on locating creative, secure and affordable housing solutions for the most vulnerable individuals and families. They also tirelessly encourage wide spread community involvement and awareness to help those who are in temporary housing situations. Nationally, the organization personally collects and delivers the most eco-friendly and high quality food, clothing and supplies to the homeless and displaced. However, Wren and her team have ultimately found that the most critical way to help is through human connection - time, compassion, respect and love. They spend each day during distribution out on the streets with the people they are serving, experiencing their worlds, hearing their stories and considering their input on how to overcome these current situations and find better and longer-term solutions. In our present world, more and more people are facing housing challenges. Whether it be a housing crisis, catastrophic illness or natural disaster, once you've lost the roof over your head it can be incredibly hard to find your way home. Losing one’s home is a daunting experience and on the flipside it is difficult to know how to help. We're here to demonstrate that each conscious and informed gesture of love can lead to sustainable solutions. So… there are many ways to access what are now commonly being called “flow states”. Flow states allow certain neurochemicals to flow through our human bodies enabling us to produce at higher and more efficient levels and ultimately feel really really good – sometimes SuperHuman. These states can be accessed in extreme cases by skiing and hucking oneself off of cliffs or by deep deep states of mediation. However, there are many ways to access these states in every day life. Service is one of many ways to not only feel Superhuman, but make the world a much more interesting, supportive, better, and progressive place. Ultimately, love is the only way forward. Please take a moment to donate not only monetarily, but live and in person, at https://spreadlovebygiving.org. A little love goes a long way.